This is not a small deal. Not by a long shot. 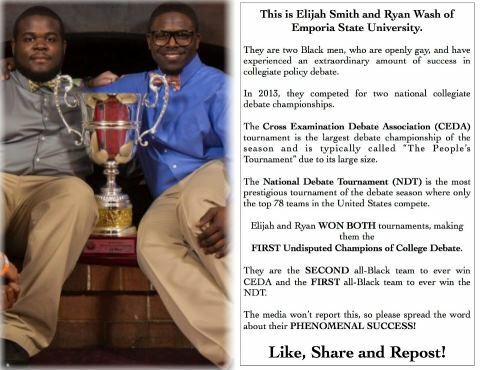 Congratulations, Elijah and Ryan! But more that that, congratulations to both teams in the finals. Your passion and dedication and arguments have spurred a much wider conversation on important topics. As well they should. And I want everyone to watch the round. If you know me at all, you know debate has been the single most influential part of my life, but I am not naive enough to believe the formats in which I participated are the only ones of value. There are different types of debate out there. Some focus on philosophy. Some focus on public policy. Some are conversational in nature. Some are executed at break-neck speeds. No matter the manifestation though, debate provides incalculable value to its participants. In an era of budget cuts, appreciating the skill and work that goes into a final round like this is incredibly important. This activity means too much to end up on the chopping block in ANY setting. Maybe, if more people understand WHY this activity is so dynamic and wonderful, we can stop letting that happen. So watch. Once in a while, the value of debate extends far beyond what is gained by individual students. It serves to foster broader discourse. Watching the reaction to this round, it’s hard to deny that this is one of those instances. I wasn’t a huge fan of critical debate in competition, but the ideas in this round… they’re complex and rich and deserve your attention. So watch. It won’t be like any type of public debate you’ve ever seen. The bulk of our political candidates would have their asses handed to them if they were required to provide warrants and evidence for their statements, or required to directly address the arguments on the other side of the debate. Anyone see a problem with that? Maybe after seeing these students put your elected officials to shame, you will. So watch. Watch. Watch in admiration of these four talented students. Watch to understand why this activity is so impressive. Watch for insight and enlightenment. Watch so you know there’s something wrong when we hold our students to a higher standard than our politicians when it comes to argument. Just WATCH it already. Clicking this image will take you to a new site. It’s safe. The video just won’t embed. having the timer on the screen was super helpful. i was never a debater, but i always thoroughly enjoyed watching debate rounds. if this format would have been on a big screen in the round i could have enjoyed it more simply because, as a non-debater, i was constantly unaware of what section i was watching or how much time was left. food for thought. Agreed. Even though I did debate, I’m not familiar with all the speech structures in different formats, so it was definitely helpful. Loved it.